In the world of Masonry, there are many symbols which represent various teachings in the Fraternity. One, however, is continually employed by many much to the chagrin of countless persons and sovereign Masonic bodies. We are, of course, referring to the skull & crossbones. In this short article, we’d like to bring to the attention of the reader and anyone else who may happen upon this article the tradition, antiquity and importance of this great symbol and to set the record straight for those who see it in a way that is outside the definitions and philosophical interpretations of Freemasonry. Robert: In my years as a Mason, one symbol stands alone as the most powerful, and not just because of its imagery. The Skull & Crossbones is a stark symbol. It stops you in your tracks and makes you notice it. It dares you to peruse it, to understand it. It does what it is supposed to do. It reminds you of your own mortality. Countless times, I have worn a square and compass pin with a skull in the middle in place of the American standard "G"(only adopted around 1717, mind you). And when I have worn this or any other item emblazoned with this image of a skull, a skull & crossbones, or any variation thereof, I get the same response, "Rob, what's with the skull?" My answer is usually, "It's one of the lessons of the first degree and of the third.” The brothers always seem to give me a half cocked frown and say something like, "I don't know about that.” It’s like a skipping record. It seems as though those who take issue with the skull & crossbones being used, largely in part, seem to replace the symbolism from what it is in Freemasonry to what it means in either pop culture or their religion. To be frank, I'm a little tired of it. Let's get real here for a moment, on the level. We have a problem with them because they may be offensive to our particular religious sensibilities or are afraid that it will offend someone else’s. If the latter is the case, then a root cause analysis would show poor education on the part of an individual lodge, and ergo is the basis for banning the practice or having an issue with the symbol. In the cases of sovereign Masonic bodies having a posture against the use of the symbol, it only solidifies our lack of confidence in the individual lodge to educate its candidates in the true symbolism we hold so dear. Either way, it’s a sad state of affairs. And yet again, I will remind you, this isn't a “devil’s room” or a “witch’s room” or anything that your “religious eyes” are seeing. 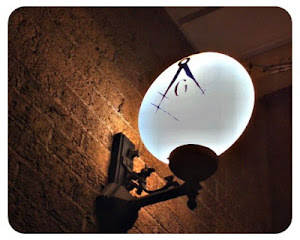 It's a Masonic room, with symbols designed to make you think. Brian: Lately, the subject of the Square & Compass being associated with a skull has been going around Masonic circles, especially on social media. To my surprise and utter disbelief, some sovereign Masonic bodies have actually issued statements that forbid the skull to be displayed with the Square & Compass. Not to seem pompous or take myself off the level, but I would have to suggest that these Brothers go back and read up on some ritual, starting with the Entered Apprentice degree. The Skull stands as a bastion in Masonry as a reminder that death is ever imminent and should incite ones reflection of their own life. The skull also relates to rebirth and as a reminder for spiritual reawakening. The crossed bones are added to signify the pillars of the portico where man stands as he labors in the quarry. 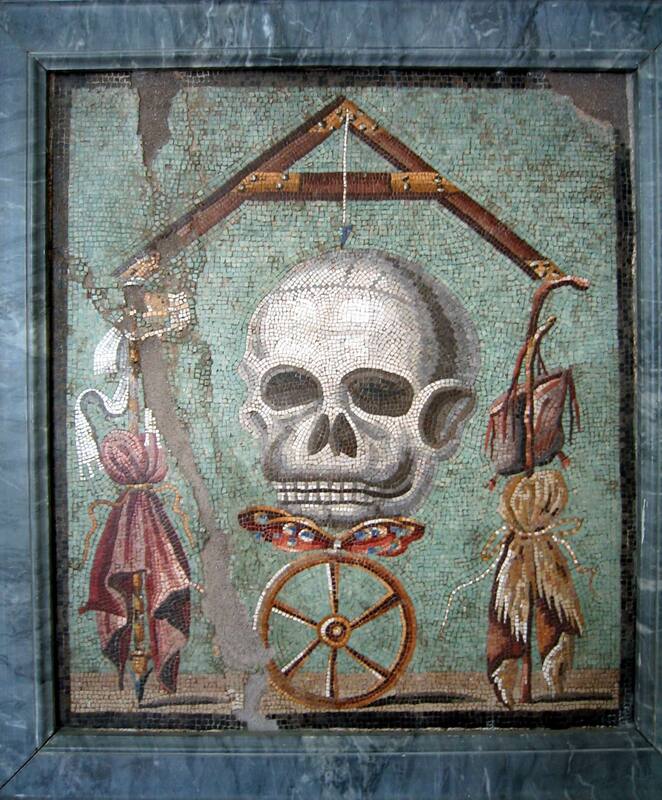 To say that the skull is a misrepresentation of Masonry is akin to saying that the company Apple is “evil” because their logo happens to be an apple with a bite taken out of it. Somehow the jump from an innocuous corporate logo to Eve taking a bite from a forbidden fruit in the Garden of Eden makes complete logical sense to some people. I have to say, that every time I hear about some officer getting his “jewels” in a bind over the Square & Compass and a skull being displayed together, I get closer and closer to having it tattooed on the back of my hands. I already have them tattooed on my arms. I would have to assume that there are more people in the world that are allergic to bee stings than would be offended or get the wrong idea about Masonry by seeing a skull with the “lights”. Therefore, perhaps we should remove the beehive from the ritual if we are looking to not be “offensive” to anyone. Brothers, we cannot intend to make everyone happy. By attempting to do so, we begin to cut and destroy the very fabric that this Craft was built upon. We are what we are and our symbols are what they are (and have been for hundreds of years, if not thousands). I have no tolerance for opinionated ignorance, especially when it comes to Freemasonry. From the very onset of ones journey as an Entered Apprentice, we are told that what is imparted within the degrees is a scratch on the surface and we are charged to educate ourselves further. This is yet another prime example of why we should, as a fraternity, quit wasting time and dispense with the reading of the minutes. More time and effort needs to be put into Masonic Education and exploring the meaning of our symbols. Perhaps then, we will not make such decisions in haste and further degrade the things that make Masonry what I have known it to be since I was eight years old. From this, we can say that it is indeed a fine symbol. A UNIVERSAL symbol which has transcended ages, cultures and languages. The symbol which reminds us that we can take nothing with us, that in death all men are equal. It represents that thing which is our transformation from this world to the next. The Grand Leveler. It is effective. Perhaps this is why some don't like it. It works so well, that it reminds us of our own mortality, our equality in relation to the rest of humanity and perhaps that hits just a little too close to home. Virtus Junxit, Mors Non Separabit. What Virtue Has United, Death Can Not Separate. 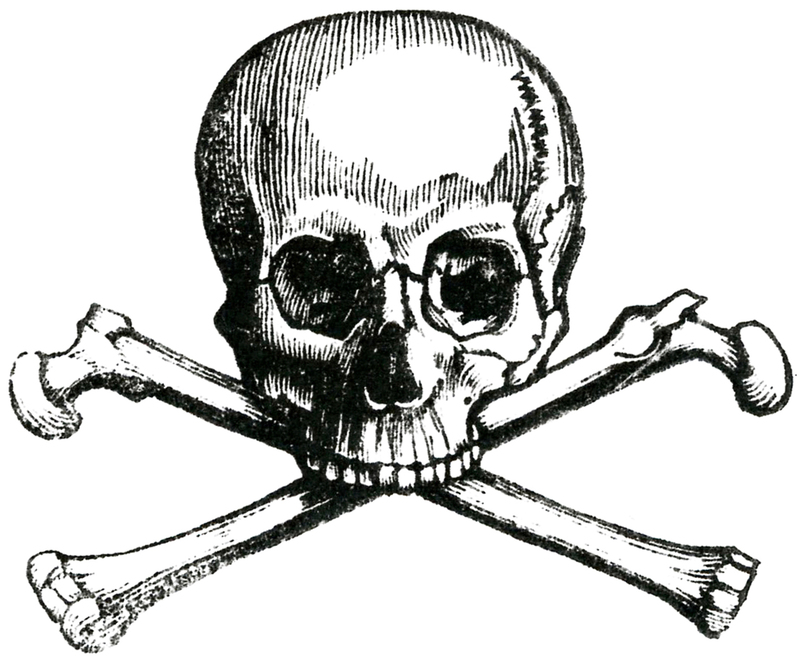 References; 1; Symbol of the Skull and Crossbones by P.D. Newman -http://www.knightstemplar.org/KnightTemplar/articles/20130523.htm, 2; Labor to Refreshment Blog, One Minute Mason Blog, 3; Masonic Dictionary “Skeleton” entry; , 4; Mackey’s Masonic Encyclopedia - “Skull” entry, 5; Mackey’s Masonic Encyclopedia “Skull and Crossbones” entry. Excellent piece, Brothers! I personally like the Memento Mori symbols--I have several rings featuring the skull including the first one I ever owned. Being reminded that we will be dead much longer than the short span of years we are alive is a great motivator. Keeps us from procrastinating--if not now, then when? Great article, posted to reddit for discussion. In Manitoba we recite Ecclesiastes 12 which as references to the skull and bones. And our M. M. candidates are shown a skull and bones in a box and are told "Let these emblems of mortality remind you...."
I disagree. The skull and crossbones are a symbol of our mortality. But by placing it within the Square and compasses the implied symbolism is that death is at the center of circumscription and virtue. This is not true, nor is it Masonic. The skull and crossbones within a square and compasses is a modern invention, used mostly by Widows Sons and other Masonic bikers. In the biker world, skulls are cool, so why not put it at the center of our identifying mark? We are a Fraternity of Light and Morality, of Knowledge and Wisdom. Yes, we remember death, as we are pursued by it, but we don't place it at the center of our identity. We are not a death cult. I will continue to keep light, and God and Geometry at the center of my Virtue and Circumscription. Thank you Eric for saying what was on the tip of my tongue. It is difficult to radiate light and knowledge if we focus on death. The skull has it's place in the lodge but let us never celebrate death over life. They Skull and Crossbones are absolutely ancient symbols of the craft. I'd have to respectfully disagree with you bro. Eric. The skull and crossbones as we've cited has been a symbol used Vince the first century. Well said! This encourages me not to be too wary about wearing what I think is some of our most moving and motivational symbolism. On a side note, I believe what Bro. Eric was saying was that the skull and crossbones within the square and compass was a modern invention, not the skull and crossbones themselves. In that sense, I can at least see what he's saying about the replacing of 'G' with the skull and crossbones. However, like Robert pointed out, the 'G' wasn't always there. So for me personally at least, it just feels more like combining different symbolism with each other, rather than "we've decided to replace God with the skull and crossbones because death is more important to us." Again though, well done and thanks! Very well done Brothers! I too get tired of everyone watering everything down. If you don't have the mettle or patience to explain and stand up for the symbolism -- well, you can conclude the rest of what I am thinking. Or maybe they were Masons themselves. After reading the posts, I am compelled to share my avatar. A "younger" brother shared it with me several years ago and I've used it since. Not to be provocative, but rather to continually remind me of my own mortality and to not focus on the petty things of everyday life. To quote verse in a song; "...someday I hope you get the chance, to live like you were dyin'..."
As a prospected individual motivated skull and crossbones, member of the books I have read about the secretive "The Skulls" - Movie. Death has no life, and anybody's bearing, on whether we live eternally. The Resurrection and the life, is esoteric or christian, which- Unites! Virtue is earned! Death is Envisioned! "I am the way, the truth, and the life..." Or, another esoteric "Skull and Crossbones"- "Give me Liberty, Or give me death!" "I, know we all, must fight for deaths, even in troublesome times." - Skulls of AIC (Associated Individuals Clubs) - Brother Riley Miller - Started Oxford, England; Dallas, Texas; Santa Fe, NM. "The Standard Elite" - Author of "86 Skull and Crossbones Based Books!" Thank you brothers for this post. I am an E.A. from East Denver 160. We are a T.O. lodge and we use the symbol of the skull and crossbones. Being an E.A., this article has helped me to understand the meaning and symbolism behind the skull & bones. Looking forward to more light. Greg Carroll, East Denver Lodge #160, Denver Colorado. Thank you for this post. I am a E.A., my lodge is a T.O. lodge and we use the Chamber of Reflection and the Skull and Crossbones. This article helped to shine some light on the meaning and symbolism of the skull and bones for me and I am grateful for that. Thanks for the education and I'm looking forward to more light. Greg Carroll, East Denver Lodge #160, Denver CO.
Good discussion and fellowship.I have the Skull & Bones emblem displayed on the back of my car, next to the drivers side taillight, for all to see, whether it's dark or light out. After all, I have been traveling. On the question of what (if anything) belongs within the Square and Compasses to constitute a Masonic Emblem ... and oh BTW there ARE other groups who use a Square and Compasses with "something" as their logo [the Free Gardners for one, look it up] ... not ALL Grand Lodges in the world subscribe to the "G" as the proper emblem of Masonic centerality. Others use the "All-Seeing Eye" and the Isreali Grand Lodge uses the "Aleph" (I believe, not reading Hebrew myself). And one could argue that any Masonic Emblem could be placed therein and not be offensive to the Craft. I, myself, have always though the "Point within the Circle" to be the most profound masonic symbol as the goal and end-work of all good Masons. While I have never seen it placed within the S&C, I would enjoy owning a piece of jewelry so designed. Great article to read as part of our masonic education, I can guarantee only a hand full of brethren in my Lodge know this. Thanks! First Degree? I've seen it in the third a lot but I can't remember ever seeing it in a 1st? Maybe something UGLE doesn't do? Outstanding article, Brothers. I would love to see further discussion on the subject. It has always surprised me that there are those who take offense to the symbols. As far as I know, the earliest use of this imagery was in the ossuaries, or bone boxes of the ancient Israelis. The boxes were just large enough that the smaller bones were placed in the bottom, and the longest bones, the femurs, were placed corner-to-corner, with the skull nestled in the center. In my own mind, I can see the Templars first examining the ossuaries and seeing the memento mori displayed in its stark reality. It should always remind us of what compasses our life about. Le Progres De l'Oceanie (http://www.lodgeleprogres.net) uses graphic symbols of mortality in the 2nd section of the 3rd degree. I won't say more here though. Very effective and, in my experience, unique. Very good note to read. Yes many Grand Lodges have discontinued using "Skull and Cross Bones" in the Third Degree Ritual. Mortality is inevitable, and this symbol potently teaches us that there are bliss after this life when we face our Maker. It reminds and assures us a place in His Mansion if a life live well lived with square conduct within the confines of civility. Just a spelling error comment, it's "Memento mori" and not momento as you have it there. Mors is the Latin word for death. Mores is a different word... conf. "O tempora, o mores!" - Cicero. Approx. oh, the times, oh the customs. Good catch! We updated it. As a Master Mason, I have been rather interested in the symbolism. I have been doing research on Washinton's apron given to him by Gen. Lafayette. I have been rather interested in the use of the skull and bones and I must say that this article is full of info that I have yet to find. I work leather as a hobby and I have always wanted to make my own apron as well as an apron for a couple of my apprentices that moved on in the fraternity to better things. I think the realization of our mortality keeps us grounded and the fact that death is The Great Leveler reminds us to respect our brothers because in death, we are all the same. We can and will always have disagreements, but respecting each other will allow us to understand that sometimes we will, but we are still brothers in the end and accept it. Being an amateur historian and a collector of Masonic items - especially since every male in my direct ancestry has been a Master Mason (and beyond) since the mid 1800's (if not before that) - I inherited from my 2X great-grandfather a red Passion Cross with the skull and cross-bones super-imposed (along with other Masonic items). He was an active York Rite Mason outside of Boston. The amount of debate on the Knights Templar apron with the old uniform (per the Grand Encampment of Knights Templar) was significant - because these aprons have the skull and crossbones on them. (I have three K.T. aprons in my collection). While these are not Blue Masonry, the skull and crossbones is quite prevalent. Look at the old tracing boards and old jewelry, the skull and crossbones is all over Masonic items. Hopefully a comment from a woman that supports the fraternity will be accepted. Thank you. Side note: My father was K.Y.C.H., A.A.S.R, H.R.A.K.T.P, R.O.O.S, and it was a huge part of his life. I inherited all of his Masonic items and am very happy to have them. Have a great day. I agree that the skull and crossbones is an important symbol. To me it goes beyond Momento Mori. I believe it represents a process that we all must endure on the path to knowledge;the death of the individual self and the birth of our immortal being. All our symbols are highly important, we should not disregard any of them, rather keep reflecting, learning and grasping the teachers they convey to us as a fraternity. Hope this meets you all in the best of health. I find this quite educational! In New York I never encountered any of this until I was in a Chamber of Reflection to become a Knight Templar. Obviously more differences between jurisdictions than I'd imagined!